A Smith tradition since 1876, when it commemorated the birthday of George Washington, Rally Day is highlighted by a festive all-college gathering at which distinguished alumnae are awarded Smith College Medals by the president. Four extraordinary alumnae received the Smith College Medal in recognition of their contributions to their communities and the world. This year’s medalists are Congresswoman Nicola “Niki” Sauvage Tsongas ’68; university chancellor Phoebe A. Haddon ’72; television and film producer Lydia Tenaglia-Collins ’88; and conductor Carolyn Kuan ’99. Seniors are required to wear academic regalia at Rally Day and Commencement. 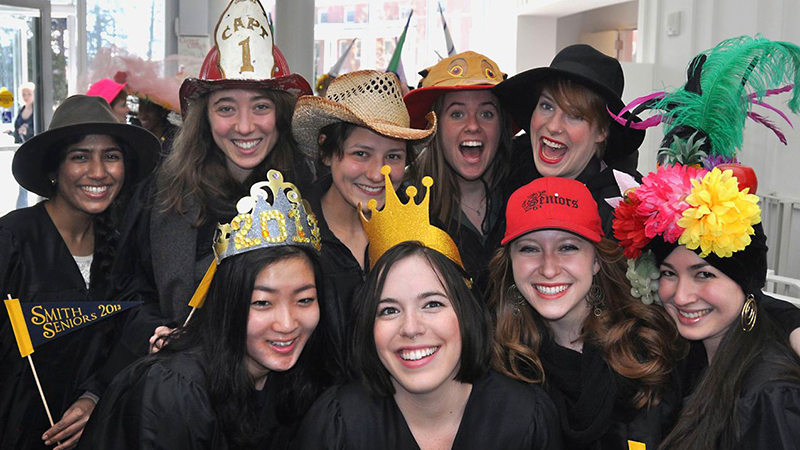 The Smith College bookstore and the University Cap & Gown Company host an academic regalia fair in early February to purchase regalia as well as other graduation products. Regalia can be purchased for $60 at the fair; the price, which covers a cap, gown, hood and tassels, must be paid in full. The 2019 regalia fair will be held Wednesday and Thursday, February 6 and 7, 10 a.m.–4 p.m. in the bookstore. Seniors are encouraged to pre-order regalia online before the fair in February to ensure receiving the correct size. Pre-orders at the University Cap & Gown website open in mid-November and close in late January. Regalia will be available at the bookstore during normal business hours after online ordering has closed. Students receiving financial aid have the option of participating in the Regalia Loan Program lottery offered through SGA. All students will be invited to enter the lottery in January and notified as to whether or not they have received regalia before the regalia fair in early February. Only students who receive Smith aid and are verified through Student Financial Services will be eligible to receive regalia through the lottery. Questions regarding the lottery should be directed to the SGA Office at sga@smith.edu. The origins of Rally Day can be traced to a series of annual celebrations of George Washington's birthday, the first of which was held at Smith College in February 1876. Over time, these celebrations evolved from essentially social dinners or receptions into daylong college events. The addition of a "rally" to the day in 1894 was eventually reflected in the name Rally Day, first used in 1906. The celebration is now held annually in February. Through the years, students have sponsored and participated in a range of activities: rallies, debates, basketball rivalries, dramatic presentations, singing and dancing. For several years, the president chose Rally Day to announce the next commencement speaker. The current tradition of sponsoring an event to benefit a charity began in 1918 when the Rally Day Show was held to raise funds for the Smith College Relief Unit serving in World War I France. The Smith College Medal has been awarded to outstanding alumnae at Rally Day since 1973. The medalists have become an important part of the program, speaking prior to convocation in classes and afterward in conversations with students. Dress at Rally Day has evolved as well. In 1944, the senior class began wearing its graduation caps and gowns to the convocation. The day still marks the first time the seniors publicly wear their gowns. In recent years, however, the caps have been replaced by inventive hats of the students' choosing (and sometimes of their own making), in keeping with the "rallying" and spirited nature of the day. Rally Day began in February 1876 as a celebration of George Washington's birthday. And though a rally was added to the day's events in 1894, the name "Rally Day" wasn't used until 1906. Even then, the celebration's origins remained evident because each year's printed Rally Day program noted the anniversary of Washington's birth on its cover. This held true until 1991, when the program read, "Exercises in commemoration of the two hundred and fifty-ninth anniversary of the birth of George Washington." A year later, the program simply read "Celebrating Smith Rally Day." Since then, each Rally Day has been marked by a theme. In 1993, the theme was "Celebrating 100 Years of Basketball." In 1998, it was "Smith Women on the Move" and in 1999, "For Women, For the World." The annual Smith celebration of Washington's birth began as social dinners or receptions. A Daily Hampshire Gazette article from 1877 reads: "The social gathering in Smith College hall, Thursday evening, was a fine affair. About 400 invitations were issued, and nearly all thus honored gladly responded. The evening's entertainment was enlivened by music from Miss Gorham and the Amherst Glee Club." In 1881, in addition to the reception, a group of students performed a parody of the George Washington theme titled "Little Cherry Tree." Over time, the receptions evolved into day-long college events. At the 22nd reception in 1898, "a little dancing was enjoyed," according to archival resources. From 1890 to 1893, dances took place on the morning of February 22 in the gymnasium, but only square dancing was allowed; the waltz was not officially introduced on campus until the first junior prom in May 1894. Games were added to the day's events in 1892, and the junior-senior basketball game soon became a traditional part of the celebration. Other events included debates, dramatic presentations, singing and dancing. In 1894, Smith decided to adopt a program more befitting the celebration of Washington's birthday. The first commemorative exercises were held that year. A February 1894 editorial in the Smith College Monthly praised the new program, noting that parents wanted their daughters to observe the day with patriotic, rather than social, celebration. That same year, a rally was held on the morning of Washington's birthday. Students gathered with their classes in the four corners of the gymnasium and sang college and class songs simultaneously. As part of the entertainment for the rally, the student council presented a mock debate-their subject that year: "Does Higher Education Unfit a Man for Domestic Life?" From the beginning, the commemorative exercises offered a patriotic and reflective aspect to the day. The exercises involved a procession, an invocation, a hymn and the national anthem. The chorus would perform, and there was sometimes a featured soloist, such as in 1911, when a Mrs. May Sleeper Ruggles performed Patria. Beginning in 1897, members of the junior class competed to write a commemorative ode for the exercises. The heart of the commemorative exercises was an oration on the subject of George Washington, delivered by a guest speaker. In 1912, the Honorable Simeon Eben Baldwin, governor of Connecticut, gave a speech titled "The Government that Washington Helped to Frame." But the next year, President Arthur Hadley of Yale broke the custom of taking George Washington as a subject, and future speakers followed suit. In 1918, John Dewey, a professor at Columbia University, spoke on "America in the World," and in 1926, Major-General John F. Ryan spoke on "The Outstanding Lesson of the War." Along with Dewey, distinguished speakers at the commemoration exercises during the early 20th century included William Howard Taft (1914) and Dwight W. Morrow (1922). The first woman invited to speak at the commemoration exercises was Madame Denise H. Davey, vice chairman of the Fighting French Relief Committee, who spoke in 1943. In 1949, Ada Comstock Notestein, president emerita of Radcliffe College, was the speaker, but it wouldn't be until 1962 that another woman spoke at the exercises. Cicely Veronica Wedgwood, a member of the British Royal Commission on historical manuscripts, addressed the rally that year and became the first person to receive an honorary degree at the Washington's Birthday exercises. The tradition of sponsoring an event to benefit a charity began in 1918 when the Rally Day show was held to raise funds for the Smith College Relief Unit serving in France during World War I. In 1919, the funds went to the Armenian & Syrian Relief Fund under the auspices of the Student War Board. During the early 1920s, the shows raised funds for Smith's $4 Million Fund. While the first show featured only songs, skits were added the next year. In 1926, a faculty stunt was first included in the Rally Day show. Through the years, each program has reflected students' wit and their ability to find humor in academic life. During the 1944 show, titled "You're Sitting on My Cabbage Patch," the junior class performed "Malice in Wonderland or the Valley of Derision." Scene I was called "Paradise Lost or Junior Year Abroad." Along the way, the commemorative exercises became a convocation. In 1944, members of the senior class began wearing graduation gowns and caps to the exercises. The day still marks the first time that seniors publicly wear their gowns. But the caps have been replaced by inventive hats in keeping with the spirited, "rallying" nature of the day.